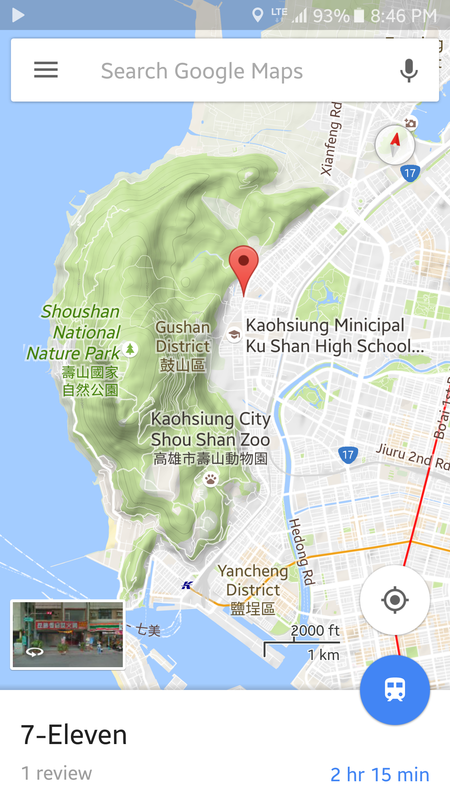 Kaohsiung is home to a huge population of macaques that reside atop Shoushan, a large mountain right at the edge of the coast. Our starting point was a 7-Eleven convenience store at the base of the mountain. Around the corner and up the street from there, you’ll find a temple and that’s where the real trek begins. 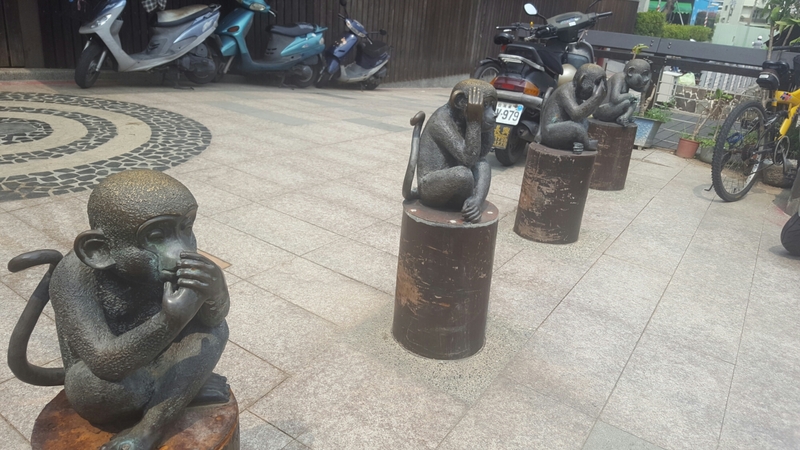 They have monkey statues out front doing the 🙈🙉🙊 poses so you’ll know you’re in the right place. 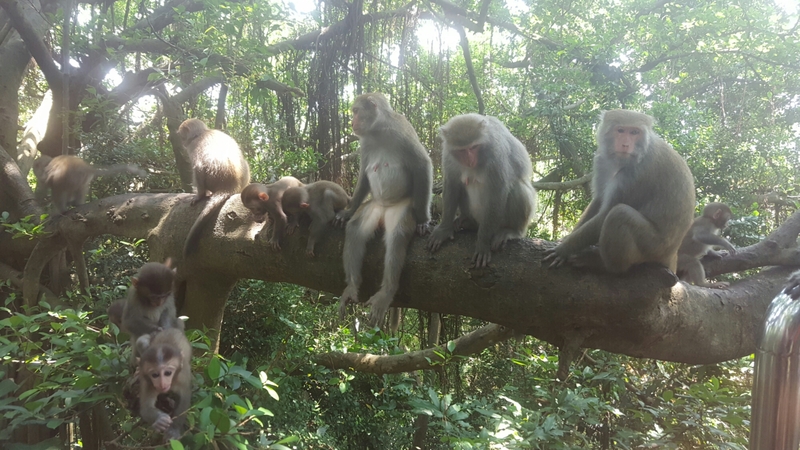 Early into our climb, we ran into a big group of monkeys just chilling out beside the trail!!! They weren’t that shy around humans- they just kind of did their thing and looked at us with curiosity for a while. 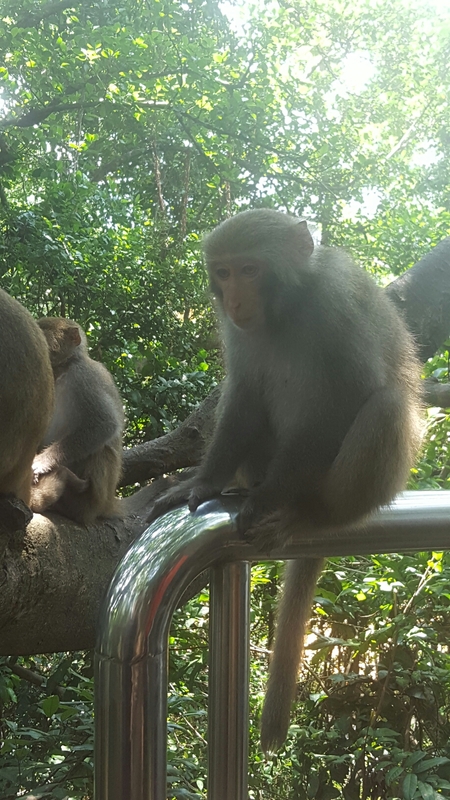 We met a nice man there beside the monkeys who told us some interesting facts about this particular population of monkeys and their habits. In front of human food, they can get aggressive and they are also known to assert their right to the land against other local animals like the barking deer and wild pigs and dogs. 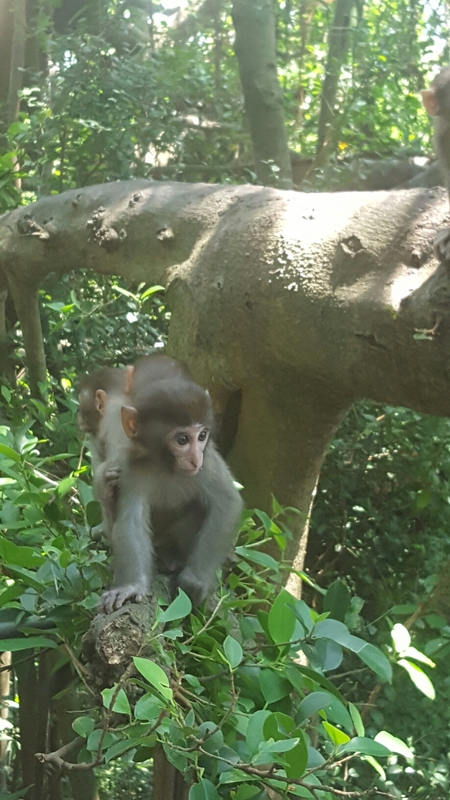 He said that we should remember that even though we as humans tend to think we own everything, the monkeys are the true kings of this mountain. 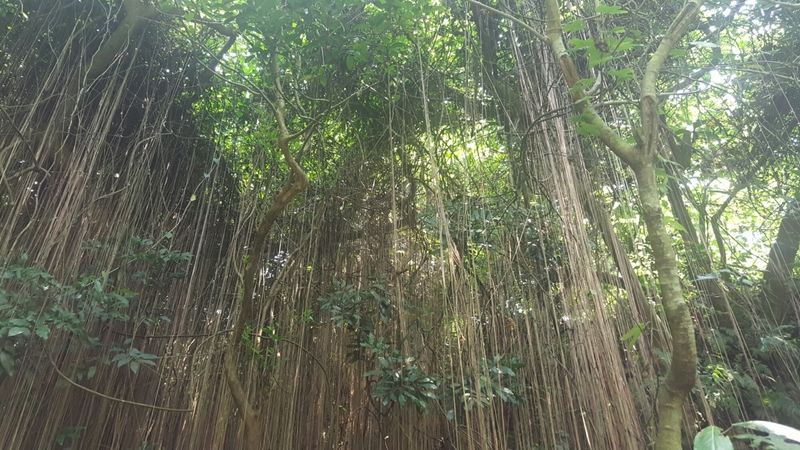 We also learned that monkeys live in heirarchical tribes, and as we were talking to the man, he pointed out a “king” monkey that walked onto the path. The monkey was large and intimidating. He even took an angry swipe at a passing female hiker! We had to stay totally still until he left the path to avoid angering him more. After that scary encounter, we thanked the man for his free monkey lesson and carried on up the trail. 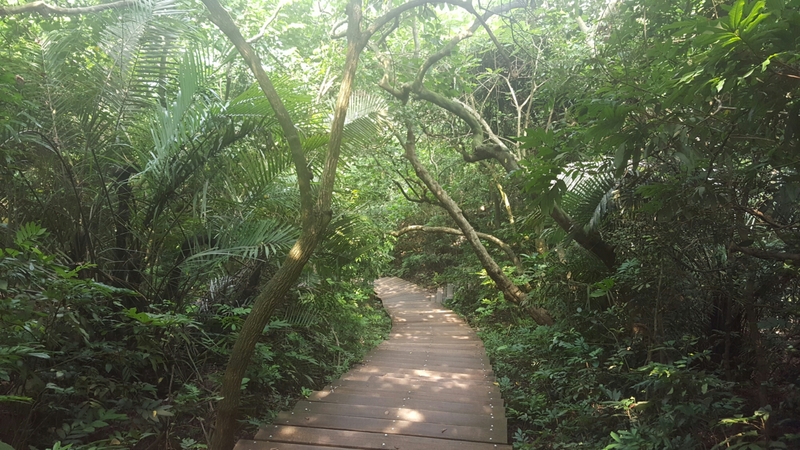 As in South Korea, the hiking trail was mainly comprised of wooden stairs and plankways which made hiking, though steep, quite simple. It was definitely hard though!! With the heat and the steep flights of stairs, I just about used every rest stop along the way to catch my breath and sip some water. 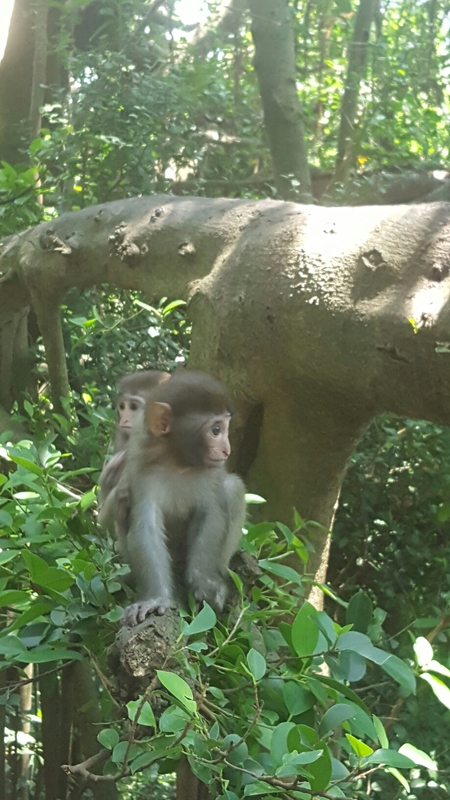 Since the monkeys are notoriously aggressive when it comes to food, there were a lot of signs around saying not to take food or drink out of your bag lest they attack you, so it was really hard to keep my energy up without having much to eat. The rest of the way up, we didn’t see many other monkeys. The peak hours to see them are early in the morning and later in the afternoon, but we were climbing around noon. 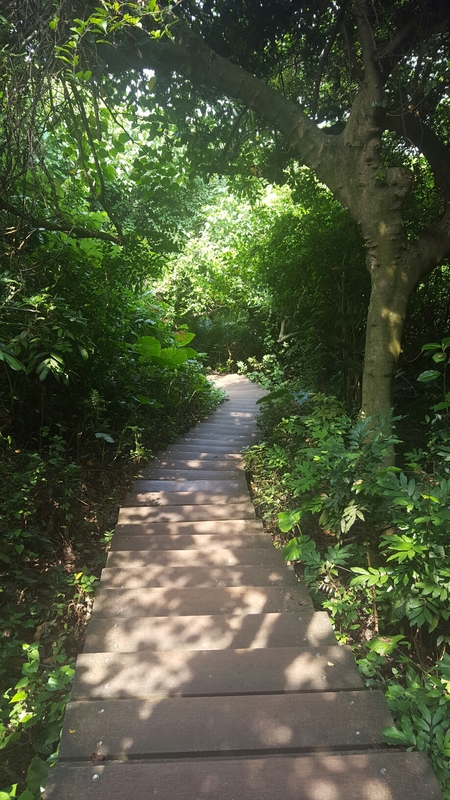 We did get to see a variety of butterflies, insects, and birds, though we definitely heard more birds than we saw. 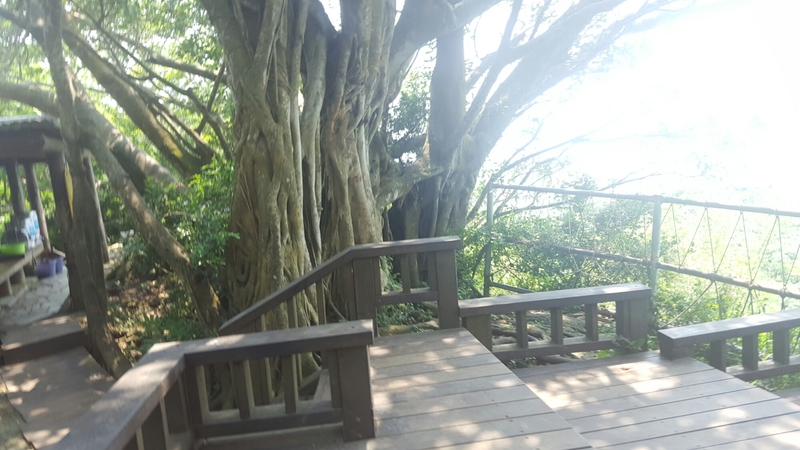 At the very top of the trail, there was an amazing ocean view, a great breeze blowing through, and there was free herbal tea at the rest area: just what we needed to recharge. If you ever get a chance to do this hike, follow the signs for “The Booth” and you’ll find the tea station. If we hadn’t asked a stranger where to go, we would have completely missed it! We hung out for a while and took some selfies before making our way back down. We desperately needed lunch after the no-snack hike! At the very bottom we saw just a few more monkeys in the trees. We hurried back to 7-Eleven and I swear, I’ve never scarfed down a hotdog so fast. Lol. Our little hiking adventure took a grand total of 3~ish hours, but it wiped us out completely, so we headed home just as the rain started to pour. Most scooter riders in Taiwan seem pretty unphased by rain and many wear ankle length rain coats to keep them dry. I will say however, that seeing as my helmet didn’t have a visor, my face has never felt so moisturized. Thanks rain storm!! Overall it was a great experience and I’m so glad I didn’t miss out on seeing so much wildlife up close. We asked a lot of strangers for help and directions along the way, and everyone was always very ready and willing to help us. Strangers also asked my friend for help, and she did her best to help them as well. It was really nice seeing how kind people could be. Tomorrow, our plan is a little all over the place. Sleep in, visit my friend’s dad’s farm, visit a temple, go to an escape room cafe thingy, see a light show, and go to a night market. So much to do! I’m posting photos of my trip on Snapchat and Instagram so feel free to follow me there! Also I think when I get back to Seoul, I’ll do a final post with all of my nicer DSLR photos since I’m blogging from my cell phone at the moment.